« Casalinho’s Permaculture Design Course Announced! Caroline Stubbs is an illustrator, writer and gardener living and working in South Dartmoor, South West England. She’s also the wonderful cook on the course I’m on. When we all rush up stairs for our tea and coffee fix in between sessions, Cari is often there in the kitchen serenely drawing. These are a couple of pieces that I’ve been watching come to fruition. Cari’s own blog, Harvest Moon, is full of more examples of her work, and some gorgeous photographs heralding Spring. 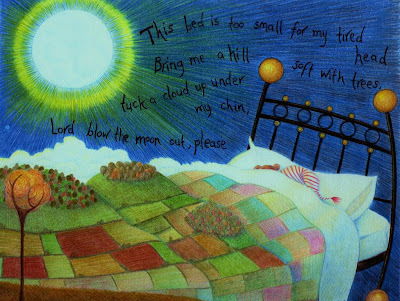 Lord, blow the moon out. This drawing is executed in coloured pencils. The intensity of colour is amazing. Don’t you just adore the patchwork of fields on the quilt? I think I recognise the inspiration for this striking tree piece from Ragmans Lane Farm. But who cares if I’m right, they’ll be a wonderful reminder for me of a pre-Spring landscape regardless. Please, if you’ve enjoyed these couple of pieces, take a look at Cari’s other work on Harvest Moon and pass on your thoughts.